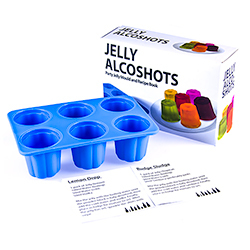 Add some flavoured jelly's to the evening for something a little different, this jelly alcoshot kit includes not just the mould to make the goodies but also a recipe book with loads of different ideas and simple easy to use instructions on how to make them. With such delicious options available as jelly-colada, lemon drop, berry berry jelly, purple passion and the delightfully named rudge sludge there are bound to be a few options here which you will love. The recipes tell you which flavour jelly you need and which spirits to add to the mix and of course you can make a variety of flavours all at the same time. You can really get the party started with some of these and our jelly alcoshot kit is a great value way to make simple and easy treats for your entire group to enjoy. Why not serve up along with some of our hen party games, the winner gets to sample one of these amazing flavours.